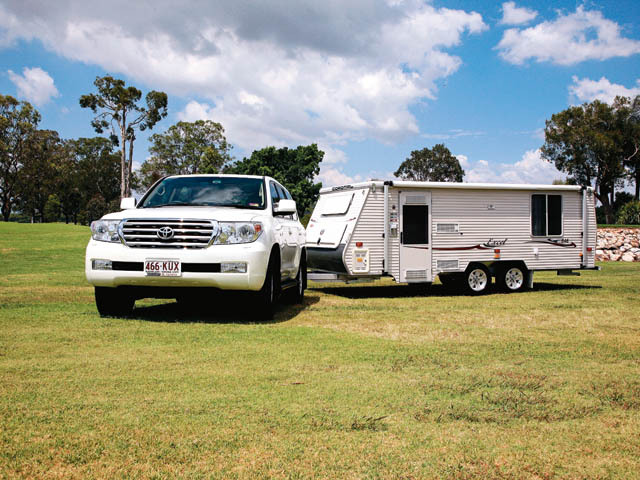 Brisbane-based City Caravan Centre’s Mark Glencross is a keen golfer, and when we were considering a photo location, Mark immediately suggested his local golf club. With an ATM of 1790kg and a towing height of just over 2m, the Excel pop-top is eminently suitable for towing by a wide range of vehicles, including Falcon and Commodore sedans. Indeed, the LandCruiser we used was overkill as the Excel doesn’t require a large club to get a good drive length. Although the Excel is clearly pitched at the budget section of the market at $40,610 plus on-road costs, it comes standard with a Knee leaf spring-based independent suspension system for the tandem axles. So, even when getting off the smooth of the green, the Excel still has a stable ride. Above the suspension, the chassis is box section SupaGal steel and the body frame is extruded aluminium that has the quite characteristic Coromal-style aluminium cladding riveted and glued to it. Above the body, the pop-roof is full length, which gives the impression that the style of the van is short, but full height. All the windows are tinted glass hoppers, except for the one at the rear nearside, which is a slider. The door is the somewhat familiar Camec triple locker. Up front, the boot has a moulded lid and has been designed to hold the 9kg gas cylinder. There’s still space for other items like the power lead, hoses and any awning fittings but maybe not the golf bag. Part of the boot space is also taken by the vented battery box, which holds the 110Ah deep-cycle battery. With the gas cylinder in the boot, the drawbar looks quite empty except for the normal features like the ball coupling, jockey wheel, handbrake and mains pressure tap. Raising the roof is a matter of unclipping the corners and stepping into the clubhouse to elevate the roof. Once inside, a layout that’s certainly good for a family is revealed, but equally it could be used comfortably by a couple who take the grandchildren away occasionally. Given that there are no bulky full height cabinets, the Excel has quite an open feel about it. The lounge at the forward end provides seating for four or five people, or two in comfort. Above the front lounge seat, which can be used as a bed, is a second bunk bed that folds out from above. It’s quite a neat piece of design, and the table can still be used without too much trouble. 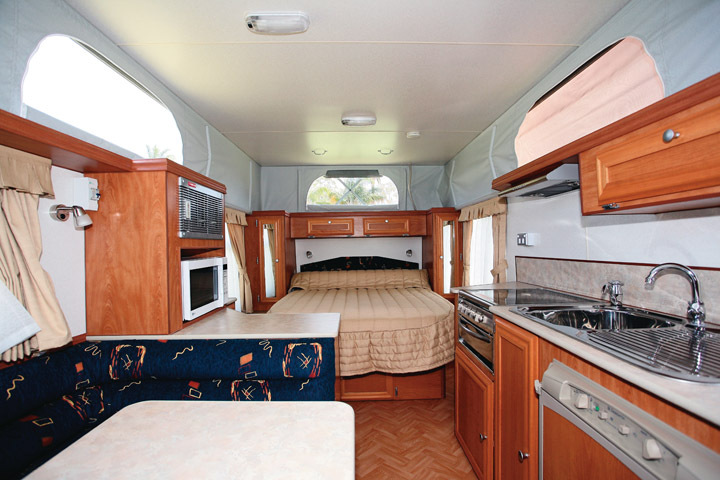 The galley offers a Smev four-burner cooktop/grill next to a stainless steel sink/drainer with a Dometic 90L fridge underneath. There’s not a great deal of benchtop area and the storage consists only of two cupboards (one with an inbuilt drawer) and a small overhead locker. However, across the aisle is a cabinet that offers more cupboard space, benchtop area and a microwave. On this review model, the optional split-system Heron air-conditioner fitted above the latter. At the rear of the Excel, the island double bed has windows on either side and is surrounded by a bedhead of side wardrobes and floor lockers. There’s under-bed storage too. With the Excel 546, both the budget and the layout are going to suit a family, especially as there is no need (in many cases) to acquire a tow vehicle as well. It doesn’t have all the features seen in some vans these days, but it certainly has all the essential requirements. Looking at this van’s scorecard, it’s one without too many handicaps and designed to give a good run down the fairways.